Murano and Burano Islands are most pleasant during the spring/summer. We are comparing Murano Glass Factory and Burano Lace Tour Venice Prices from leading ticket suppliers and Try to find you Cheap tickets prices on the market. Your half day trip begins in central Venice where you will meet with your English speaking guide and climb aboard a comfortable water taxi. Cruise through some of Venice's minor water way's passing between gothic buildings on your way out to the Venice Lagoon. On the way your guide will fill you in on some of Venice's history. This small group tour is ideal for those who would like a more personal experience as there will be opportunities to ask any questions. 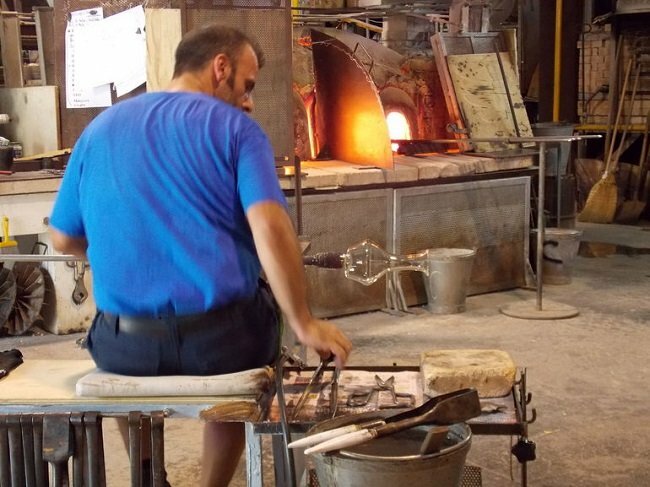 Your first stop will be at Murano Island, home to one Venice's glassblowers. You'll be guided through this quaint island to a fully functional glass making factory, see the craftsmen still practising the traditional glassmaking tradition. Learn how the glass is heated, shaped and coloured then take advantage of free time to explore, you may want to visit the church of Santa Maria e San Donato, or shop for souvenirs. The second stop is at Burano Island, known for its colourful fisherman houses and lace making workshops. While on the island you'll have time to visit a lace-making studio, learn how the lace is produced and also have free time to grab a bite to eat, visit the lace museum or meander the picturesque canals. You'll then cruise back San Marco Square and say goodbye to your guide. If your looking for a relaxed and unhurried tour of Murano and Burano then this is it, you will have a full 5 hours for this sightseeing tour. Suitable for families, friends, or individuals of all ages. Your Experience With Murano Glass Factory and Burano Lace Tour Venice? Take a day away from the crowded streets of Central Venice and visit the most popular islands of the Venice Lagoon. Learn about two of the industries which made the Venetian Empire so wealthy, Glass and Lace, and see demonstrations in original workshops. Benifit from the knowledge of your local guide and relax on a comfortable water taxi while cruising on the Venice Lagoon. What Murano Glass Factory and Burano Lace Tour Venice Includes? Round-trip transportation by semi-private water taxi, from Central Venice to Murano and Burano Islands. Visits to a glass factory on Murano and lace workshop on Burano. Free time to explore the islands independently. A professional, English speaking tour guide. Depart from mainland Venice – visit Murano and glass workshop – cruise to Burano and lace workshop – return to mainland Venice. If you want to buy some souvenirs the Murano is the best place to buy real Venetian glass. Burano has many shops selling lace, if you want to buy local then you can purchase directly from the workshop. Travelers Reviews about Murano Glass Factory and Burano Lace Tour Venice? The tour has an impressive 4.5 out of 5 from customers on Trip Advisor and Viator but Get Your Guide has an even higher 4.7-star rating. Participants seem to particularly enjoy watching the glass blowing demo and visiting the shop. Certain comments make it clear that there is no pressure to buy anything at either location. Cancellation fees may apply if cancellation is made less than one week in advance. Please be at meeting point at least 10 minutes prior to departure time. Lunch, tips and hotel pick-up/drop-off are not included in ticket price.